Oakwood Pool & Spas is the ultimate pool and spa headquarters! We offer a wide range of services and supplies designed to meet your needs. We have a very knowledgeable service staff that is willing to help you with your questions and products. You can be sure of the best when you use us as your pool, spa, and outdoor decor company. Pool Equipment, Supplies and Chemicals – We stock only the best in pool and spa equipment and have a large stock of parts on hand. Brands like Polaris and Sta-Rite are your assurance that your family will enjoy years of trouble free fun. BioGuard pool chemicals provide you with crystal clear water at all times. In fact, we even offer free water testing so you can properly adjust the chemical balance of your pool’s water with a minimum of hassle and expense. In addition, our trained and experienced technicians are ready to handle any service problem that you might encounter. Automatic pool cleaners, control systems, filters and pumps, pool lighting, parts, and supplies are all available to keep your personal resort in top condition. Hot Tub Spas – If a spa is more to your liking, we sell, install, and service the best, and we service the rest. We sell Hot Spring portable spas and offer the following lines from them: Highlife NXT, Highlife, Limelight, and Hot Spot spas. 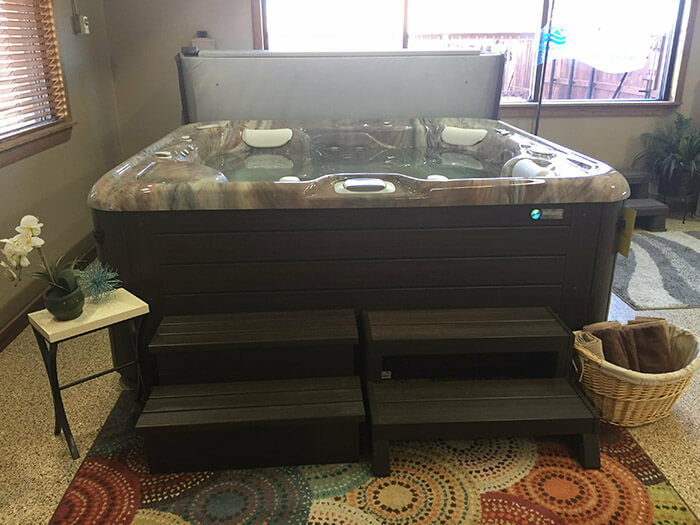 With the large variety of hot tub models that we offer, we’re sure to be able to find just the right fit for your personal location, your family size, and your budget. And, as with swimming pools, we’re ready to provide service, equipment, hot tub parts, and supplies for your spa at all times. All you need to do is get in and relax. Pool Service and Pool Repair – Service and repair of swimming pools and spas, leak detection and repair, pump and filter repair, weekly pool maintenance, equipment repair and replacement, and clean-ups are some of the services that we provide, expertly and efficiently, and at a fair price. Grills – Oakwood Pool & Spa also carries many accessories for poolside relaxation. Big Green Egg grills and Green Mountain Grills make it possible to enhance your fun time with great grilled meals for your family and friends.